If you are working in research and innovation, you may recognize the need to combine the creation of technology and the creation of a positive impact in society. You may call it Responsible Innovation, or Corporate Social Responsibility, or Creating Shared Value. In that case, you will probably be busy indeed, running from meeting to meeting, talking to clients, managing projects, combining diverse concerns for technology, for marketing, and for society–within your organization and outside, with relevant stakeholders. If you are interested in using this Canvas, please contact Marc Steen, senior research scientist at TNO (marc.steen@tno.nl). This Canvas was developed in the JERRI project, which aims to promote Responsible Innovation, by Reijer Gaasterland, Suzanne Ogier, Joram Nauta and Marc Steen. In my previous post I wrote about my ambition to help to (better) focus innovation projects on promoting people’s wellbeing. This begs the following questions: What is currently wrong with these projects? And what could be done differently? I will address these questions in the next couple of posts. Many innovation projects aim to develop technology—a product, a machine, a system, a ‘thing’. Technology, however, cannot be an end in itself. It is always a means towards an end. Therefor, we need to focus on the ends which we want to achieve with the technology we develop. We may aim to realize a sustainable energy system or to promote people’s wellbeing—to name but a few. An explicit focus on a specific and practical end, e.g., to promote healthy dietary choices in teenagers, is likely to improve the quality of decision making in a project and thus the quality of its results. Project team members can then more clearly focus on this end, rather than on the ‘thing’ they work on. I am inspired by Aristotle’s plea to focus on ultimate ends: to focus our activities—in our case: working in an innovation project—on the ultimate end to enable people to flourish. Now, how can our innovation projects promote people’s wellbeing? Probably not by on saying ‘thou shalt be happy’. Not by blueprinting exactly what people should do. Not by imposing my ideas on ‘the good life’ on others. But rather by creating enabling and empowering conditions for people to flourish. Each person in her or his unique way. This is the key idea of the Capability Approach (CA), which was developed by economist Amartya Sen and philosopher Martha Nussbaum. It aims to enable and empower people to expand relevant human capabilities, so they can live lives that they value and have reason to value. Examples of such capabilities are: being able to have good health, to be adequately nourished, or to have adequate shelter (here is a list of 10 central capabilities). The CA focuses on human development, which reduces the risk of paying too much attention to ‘things’. ‘Things’ receive attention only to the extent that they contribute to promoting wellbeing. A focus on the capability to drink fresh water would entail a focus on building wells, and also on maintenance and on cultural acceptability of new social practices, e.g., of women walking on foot to these wells. Furthermore, the CA focuses on freedom, on creating conditions in which people can freely choose capabilities to develop so they can live different versions of ‘the good life’. This reduces the risk of prescribing specific behaviours. A focus on the capability to freely move around would entail a focus on creating enabling conditions also for people with different physical or cognitive abilities. Moreover, the CA will enable people to participate actively and creatively in the project, in problem definition, in solution finding, and also in the adoption and implementation phases—in line with the social innovation approach, which aims to solve social problems by developing social interventions and changing social processes. 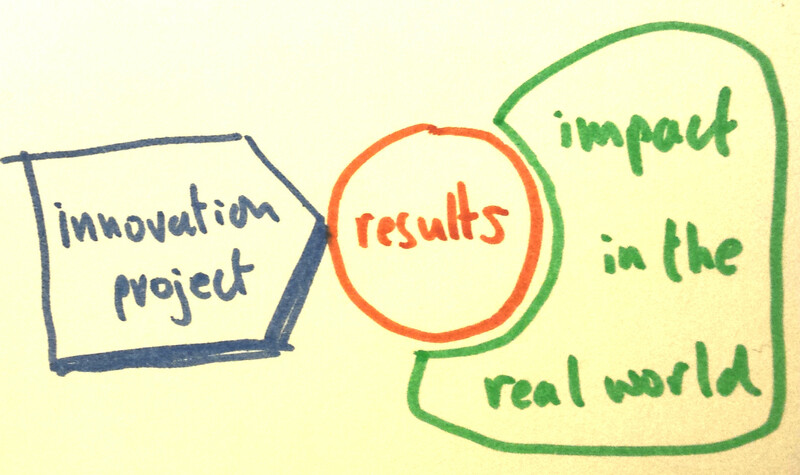 So, what would be my proposal to organize innovation projects differently? I would love to see project managers, team members, project partners and stakeholders discuss the ultimate goals of their project in terms of enabling specific people to develop specific capabilities: ‘Project-P aims to enable an X-amount of people of group-G to develop capability-C, so that it improves with a Factor-F’. This goal can then be monitored during the project’s iterative cycles, and the project can then be steered towards this goal. Do you work in innovation projects? Do you want to focus your work on promoting people’s wellbeing? What do you think, will it help you to articulate specific goals? After clarifying what I mean with ‘Innovation for Wellbeing’, I would now like to discuss the context in which I work and my ambition. I work at TNO: an independent research and innovation organization in The Netherlands, which employs 3000 people. We work in diverse projects, ranging from developing intervention programs to promote healthy life styles, to the development of innovative solutions for energy and mobility. We execute our projects in close collaboration with our customers: with large and small companies, governments and NGOs, like War Child. TNO’s mission is to promote innovation and competitiveness in industry, and to facilitate societal transitions and promote wellbeing . My role at TNO is in organizing and managing (parts of) projects. I received my training at Delft University of Technology, at the Faculty of Industrial Design Engineering. This school combines industrial, technological and social concerns and its curriculum is based on design thinking: the organizing of multidisciplinary and iterative processes of problem-setting and solution-finding. In addition, I did a part-time PhD at the University of Humanistic Studies, where I was introduced to various philosophical perspectives to look at, e.g., the organization of innovation projects. At TNO and elsewhere, many projects focus on developing technology, with the risk of neglecting social and business concerns, and focus on delivering a prototype, with the risk of neglecting the scaling-up phases, which are critical to realizing positive impact in society. My ambition is to help my colleagues and our clients to organize our projects in such ways that they effectively promote people’s wellbeing, and to evaluate our projects’ actual impact in the real world. I feel inspired by Victor Papanek’s ‘Design for the real world’ (first published in 1971), in which he discusses various ways in which designers can contribute to making the world a better place: designing for disenfranchised people; going into the real-world and designing with them; training people locally to design locally; and training people locally to train others to develop their design capabilities (pp. 84-85, 2nd edition). To this I would like to add: to help colleagues and clients to focus on real-world problems and to develop real-world solutions that have a positive and sustainable impact in society. What is the context in which you work? Do you have ambitions to promote people’s wellbeing and/or to create sustainable impact? First, let’s create some clarity on what I mean with ‘innovation for wellbeing’, so we can focus our discussion. And let’s do that step-by-step. Let’s start with the word ‘innovation’. I propose to use this word to refer to the development of new social practices, enabled by the creation of a new product, service, process or way of doing things. This focus on new social practices implies a focus on the impact of the innovation, rather than on the product or service. Moreover, this definition includes both technological innovation and social innovation, and focuses on practical applications and consequences. Furthermore, it is worth noting that, for me, a large part of the field of ‘design’ (e.g., human-centred design, product, service or interaction design) and ‘design thinking’ are included in this definition of innovation. And how do I use the word ‘wellbeing’? I use it to refer to people’s overall wellbeing, to their flourishing as human beings. This conceptualization is rooted in the idea of ‘the good life’ (or eudaimonia), developed by Aristotle, and goes beyond the experiences of positive emotions. ‘The good life’ will include positive emotions, but also difficult emotional states, e.g., when striving to achieve something that is meaningful to them, like raising a child. Moreover, ‘the good life’ will differ greatly between people. Therefore, if we aim to promote people’s wellbeing, it is necessary to create enabling and empowering conditions for people, so they can freely choose to live their own versions of ‘the good life’. Now, let’s bring these words together. 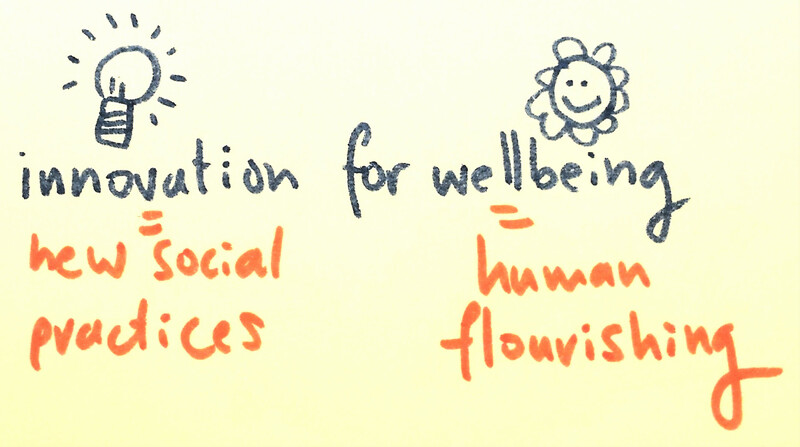 With ‘innovation for wellbeing’, I want to refer to the organizing of technological and social innovation, which lead to new social practices, which create enabling and empowering conditions for people to freely choose their own unique ways to flourish as human beings. Two examples. A project that aims to develop a smartphone app to help people with a chronic disease to monitor and improve their life style and to stay healthy as much as possible. Or a project that aims to facilitate collaboration between a group of citizens and local government officials so they can jointly explore problems in the city’s living conditions and develop social interventions to improve these. Please note that in the first example the people who develop the app are different from the people who will use the app, whereas in the second example the people who develop the innovation will also collaborate in the practical application of this innovation. What do you think? Is my understanding of ‘innovation for wellbeing’ clear? Any questions?